Here at Grinnell, we hope to create and maintain a strong presence both on campus and in our town, hosting events that will impact QuestBridge Scholars for years to come. We are an officially recognized as an organization on campus and often host events with other groups and organizations, such as food recovery (a means of sustaining food and making sure less goes to waste), parties, and other events for QuestBridge Scholars specifically. These Scholar-specific events usually fit into monthly themes provided by the main QuestBridge office, such as Career Development, Transition, and Academic Success. We are connected with staff in admissions, and pride ourselves on being able to solve situations by finding the right resources on campus. For example, we worked with the Center for Religion, Spirituality, and Social Justice (CRSSJ) and the Financial Aid Office to create and operate a textbook lending library to ensure that all low income students have access to books in a timely manner. At Grinnell we have weekly meals with one another, voting on the best time to meet. Our Quest Board meets once a week at a different time to plan events which have included assisting our scholars with filling out taxes, an overnight Homeless Awareness Event, our famous QuestLove Valentine’s Day event, and our yearly Halloween Harris. 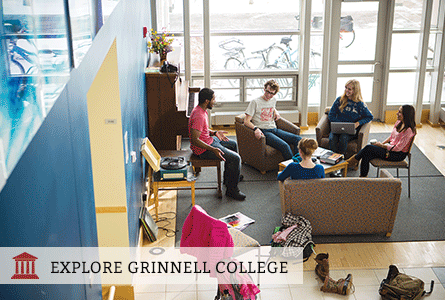 We at Grinnell love to travel and do as many cool and fun events as we can, making a strong QSN Chapter that is the jewel of the prairie.